Starting on the Pacific, Eleni Kounalakis became the first Greek-American female to gain statewide elected office in California, as she was convincingly elected the state’s Lieutenant Governor. Her and her family’s commitment to the Greek-American community and to Greece itself has been well established. Now she has a platform that can make an even greater impact on these fronts. Greece’s economic strategy includes developing a film industry, a more robust start up sector, and further opportunities in the renewable energy sector. Imagine what doors the Lieutenant Governor-elect can help open in Hollywood, in Silicon Valley and at some of the top solar and wind companies in the world. Furthermore, she is now an elected colleagues and political ally of the likely Speaker of the House of Representatives (Nancy Pelosi), the Chairman of the Intelligence Committee (Adam Schiff), and of a potential presidential candidate (Senator Kamala Harris). Coming to the Midwest, we narrowly lost the chance to see the first ever Greek-American to take statewide office, as former Congressman Zack Space came up short in his bid for State Auditor. Given Ohio’s outsized role in Presidential elections, having a Greek-American statewide official (with a historically close relationship with the community) would have been a great asset in the 2020 election. Space, however, will still play a role in Ohio politics. He remains close to Senator Sherrod Brown (another potential presidential candidate), high profile Congressman Tim Ryan, will be writing a regular column in Ohio newspapers, launching a podcast, and doing grassroots organizing – all with the purpose of drawing back the FDR Democrats (that were part of his base as Congressman) to the party. In 2020, Ohio will be critical in both the Democratic primary and the general election. 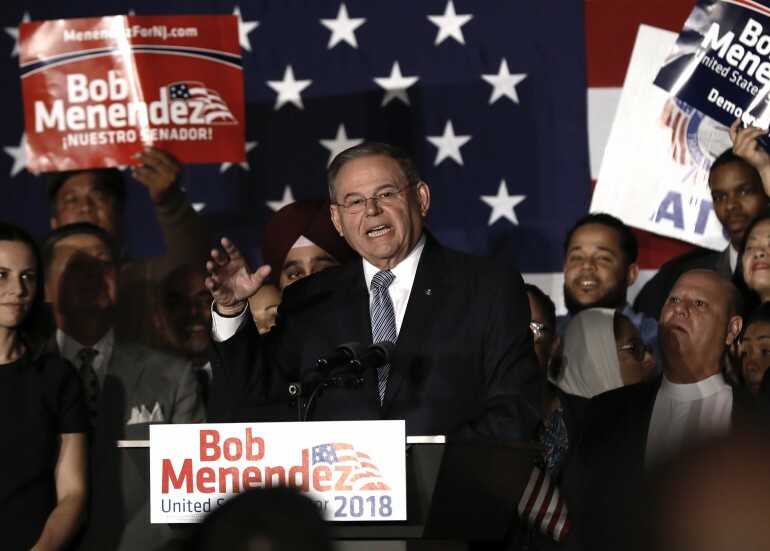 Space’s support could help a candidate break through to white working-class voters, and despite not gaining statewide office he remains an asset the Greek-American community should cultivate. Prime Minister Alexis Tsipras sent messages about Greece and its role on Wednesday during his speech at a reception held by the Greek consulate in New York. “Thanks to the efforts of the Greek people, we managed to exit the regime of harsh surveillance. Today we are all determined to turn a page,” Tsipras stressed. Expressing his gratitude to the Greek Americans for their important ceaseless efforts, Tsipras said that since 2016 he remembers their deep faith and their confidence that Greece could overcome the great difficulties and stand again on its feet. The Greek people leave behind the difficult period that started in 2010, he said. He added that the country has left behind the eight-year period when it lost a great part of its economic sovereignty and managed to become a normal country again. Moreover, he said, Greece regained its lost geopolitical role and its importance as a country of stability in a more destabilized region. “Greece is playing a leading role in the Southeastern Mediterranean and Europe,” he stressed. “In very difficult times, the Greek people have proved that they can show solidarity with those in need,” Prime Minister Alexis Tsipras said late on Thursday at the Global Hope Coalition’s Annual Dinner, where he was awarded for Greece’s stance on the refugee crisis. The prime minister noted that he accepted this award on behalf of the Greek people, because the citizens of Greece are those who deserve credit and praise. Especially on behalf of the people of the Greek islands, he stressed, as they raised the heavy burden of all Europe on their shoulders in the difficult times of the refugee crisis. “We are proud because at the time when other countries in Central Europe were building walls and fences, the Greeks opened their hearts,” he underlined. 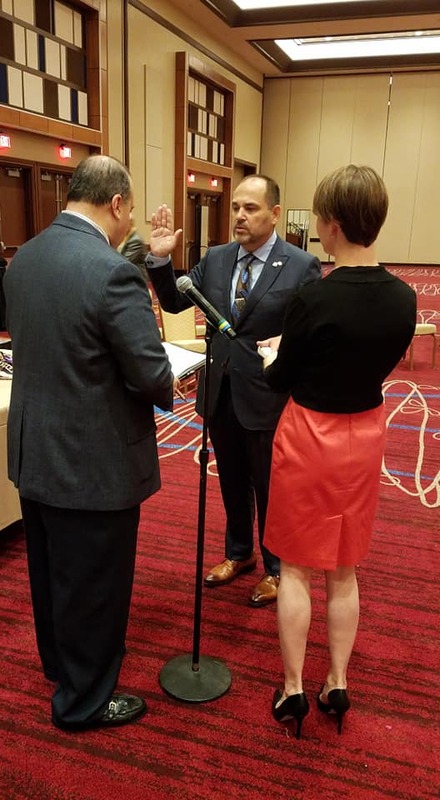 The delegates of the American Hellenic Educational Progressive Association (Order of AHEPA), elected George E. Loucas, Esq., Supreme President at the 96th Annual Supreme Convention, Atlantic City, N.J. Loucas, of Novelty, Ohio, ran unopposed in elections that were held July 26, 2018. Formal installation ceremonies were held the next day. In his inaugural remarks at the Installation Ceremony, Loucas reminded those in attendance to not forgot their history and that everyone is a legacy charged with carrying the mantle of heritage. 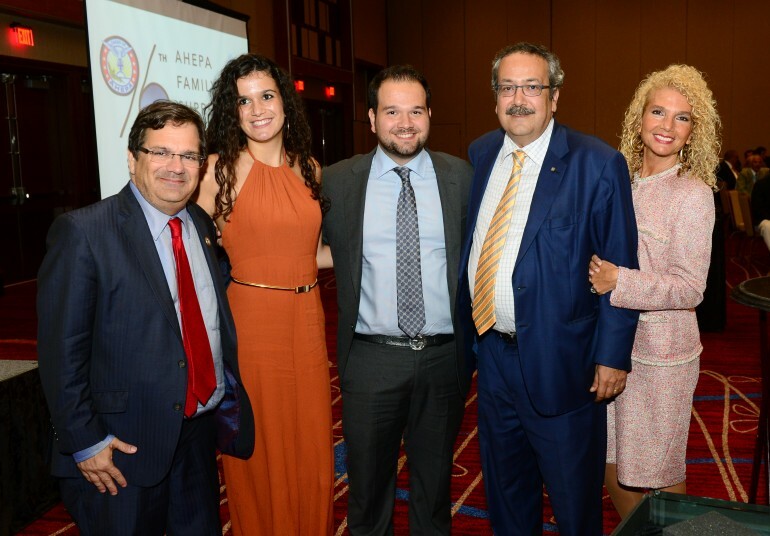 “It [History] helps to guide us for what we do today and for our future as we, AHEPA, approach 100 years of existence,” he said. Loucas is a 37-year member of Chapter 480, North Royalton, Ohio. He has served AHEPA in numerous leadership positions, including most recently, supreme vice president. In addition, Loucas comes from an AHEPA legacy of leaders. His grandfather, George, served as Supreme President in 1959. 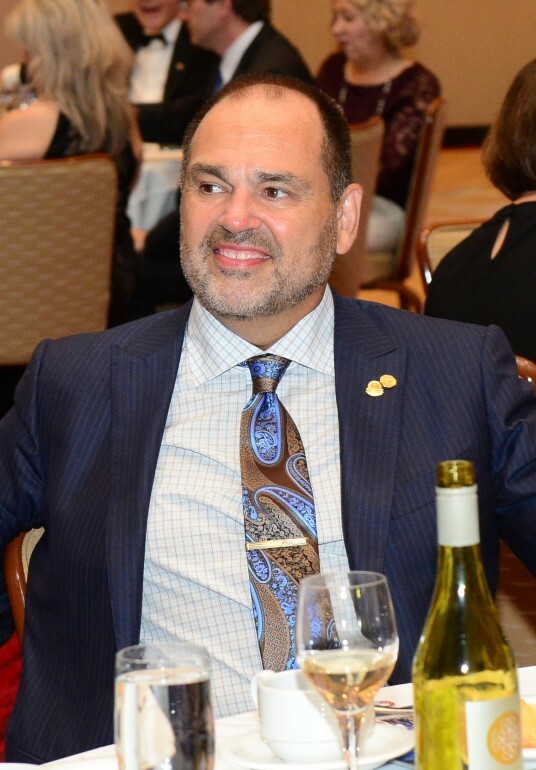 As supreme president, Loucas’s responsibilities include being the chief executive officer, and principal spokesperson, of the entire AHEPA domain, which includes chapters in the United States, Canada, and Europe. Loucas, a pharmacist and 3rd generation lawyer, founded Loucas Law in 1995 with a vision of helping families who have suffered catastrophic injuries and wrongful death in the area of complex civil litigation. He is regarded widely as a leader in fighting Drug Overdose Death (Drug OD) cases from prescription painkillers. Loucas is a graduate of the Cleveland Marshall College of Law at Cleveland State University, where he received his Juris Doctor degree, and West Virginia University where he received his Bachelor of Science degree in Pharmacy. George became a Registered Pharmacist and worked in the pharmaceutical industry while attending law school. The AHEPA Supreme Lodge is the international governing body of the organization. In addition to Supreme President Loucas, the Executive Committee of the 2018-19 Supreme Lodge is comprised of: Canadian President Christos Argiriou, Winnipeg, Manitoba; Supreme Vice President James Kokotas, Brooklyn, N.Y.; Supreme Secretary George Horiates, Esq., Moorestown, N.J.; Supreme Treasurer George Booras, Danville, Calif.; and Supreme Counselor Louis G. Atsaves, Esq., Lake Forest, Ill.; Sons of Pericles National Advisor is Sandy Papadopoulos, Atlanta, Ga., and Supreme Athletic Director Chris Atsaves, Glenview, Ill. The nine Supreme Governors are: Region I: Peter Nassos, Stone Mountain, Ga.; Region II: George Papaspyrou, Riva, Md. ; Region III: George Karatzia, Morganville, N.J.; Region IV: Jack Isaac, New Britain, Conn.; Region V: Craig Theros, Ann Arbor, Mich.; Region VI: Peter Lekas, Chicago; Region VII: Nick Dixie, Dallas, Texas; Region VIII: Wynn Storton, Palm Desert, Calif.; and Region X: Phanos Pitiris, Nicosia, Cyprus. 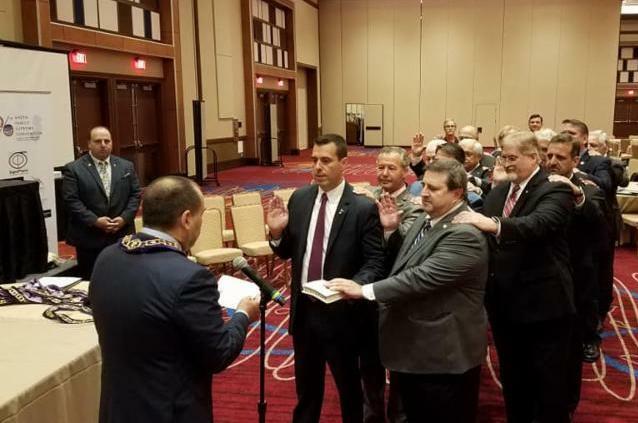 Elected to the Executive Committee of the AHEPA Board of Trustees were: Past Supreme President Nicholas A. Karacostas, Bayside, N.Y., as Board chairman; and Past Supreme Preisdent Carl R. Hollister, Mason, Ohio, as Board vice chairman. The organizations that comprise the AHEPA Family also held elections. Demi Thomas, Ridgewood, N.J., was elected Daughters of Penelope Grand President; Gregory Vourloumis, Atlanta, Ga., was elected Sons of Pericles Supreme President; and Tatiana Tsaprailis, Calgary, Alberta, Canada, was elected Maids of Athena Grand President. 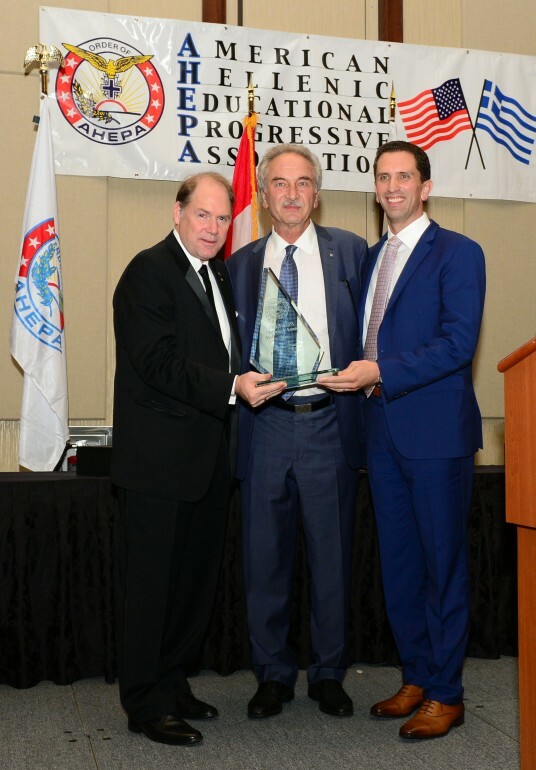 Two prominent Ahepans who are leaders in the community and within their respective professions were honored with the 2018 AHEPA Hellenism Award at the Grand banquet. They were: Demosthenes Vasiliou, CEO/president, Astra Foods; and Dr. Spiro Spireas, founder, Sigmapharm Laboratories. The honorees spoke with inspiration about the ideals and meaning of Hellenism and the importance of passing it on to future generations. 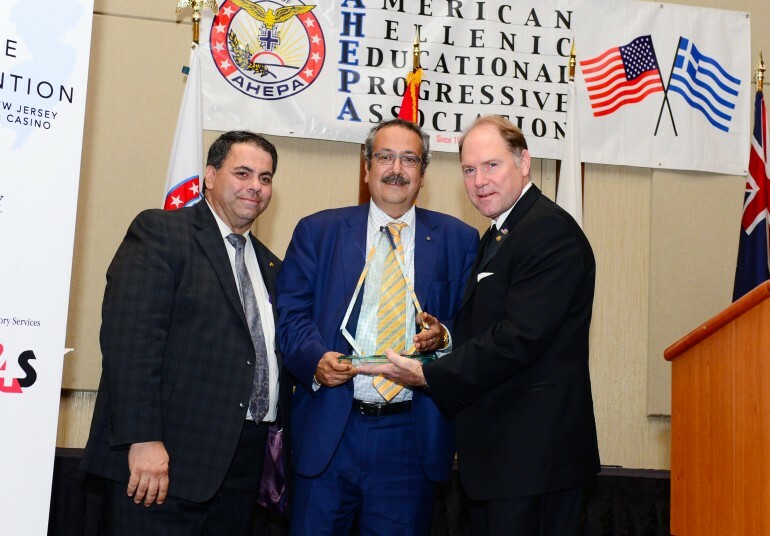 They also conveyed appreciation for AHEPA, its mission, and its work in the community. John Vasilou introduced his father, Demosthenes, stating, “My father is the first in line of people who stand up for Greece and Hellenic ideals.” John called his father his hero and role model. In acceptance, Demosthenes dedicated the honor to his family, and he conveyed his delight because the award is a recognition of all the great people he has worked with over the years. Then-Supreme Treasurer George Horiates, Esq., introduced Dr. Spireas. He described the honoree as a prominent member of the Omogenia with immense passion and a self-accomplished entrepreneur. “We are the beneficiaries of your excellence,” Horiates said. Dr. Spireas also noted that AHEPA has achieved a lot in the spirit of Hellenism, and he also spoke admirably about philhellenes and the hard work ethic they have brought to the community. Ahepan Basile Katsikis (Basile the Comedian) served as Master of Ceremonies in colorful fashion. Executive Director Basil N. Mossaidis provided greetings. The banquet program featured speakers who expressed their thanks to AHEPA for its assistance and effectiveness as an organization during its 96 years. The audience received inspirational remarks from His Eminence Archbishop Demetrios, Geron of America, who conveyed the love and prayers of His All Holiness Ecumenical Patriarch Bartholomew I and shared greetings from His Eminence Metropolitan Evangelos of New Jersey. 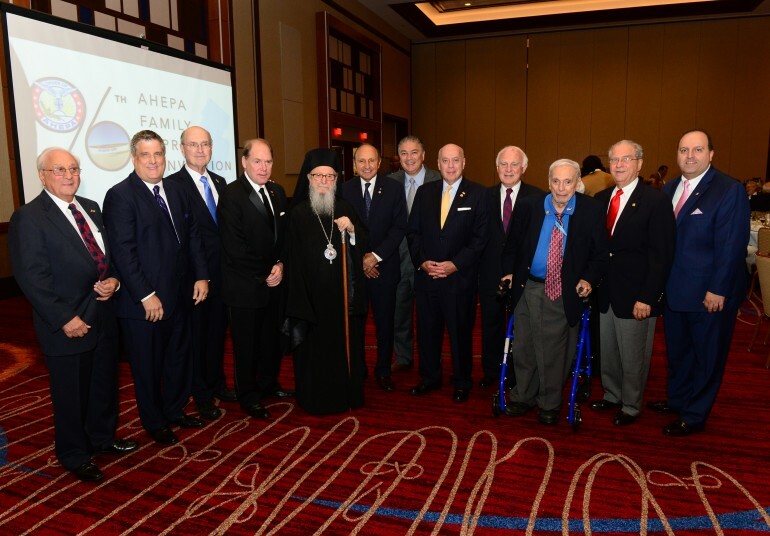 His Eminence also noted this is the 19th consecutive year he has joined the AHEPA family at its annual meeting. 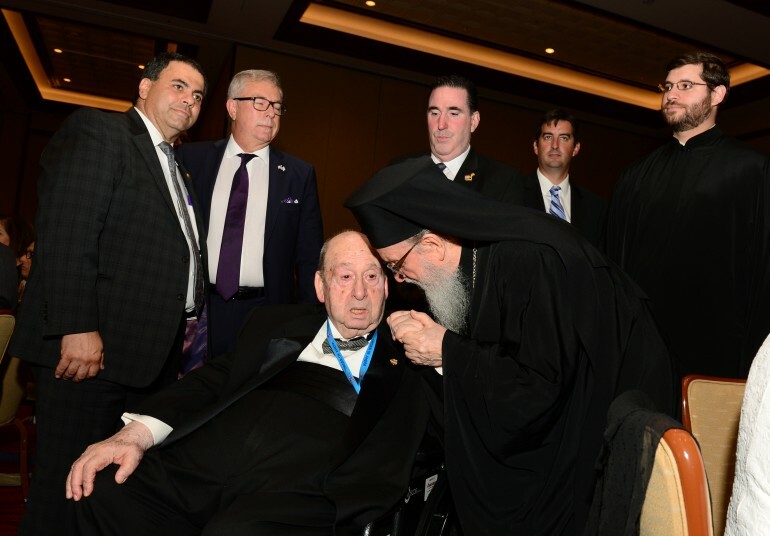 In addition, His Eminence shared a moment with all AHEPA past supreme presidents and DOP past grand presidents in the audience, taking a photo with each group. 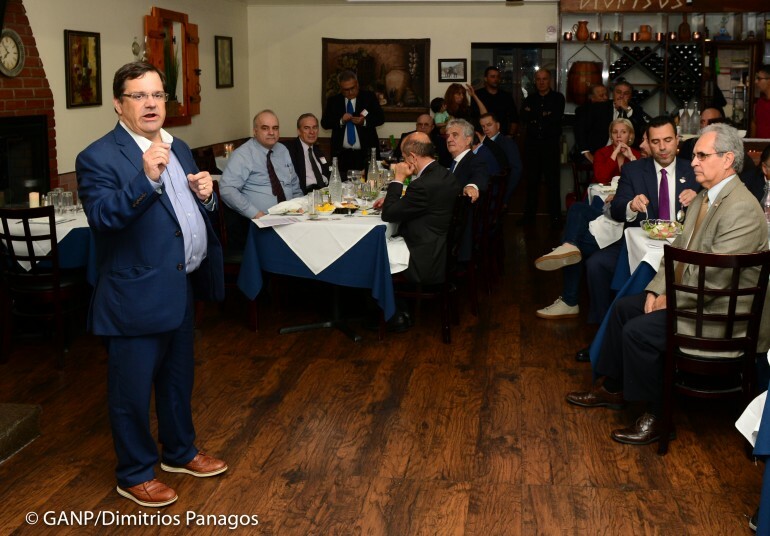 Congressman Bilirakis, co-chair, Congressional Hellenic Caucus and the Congressional Hellenic Israeli Alliance, offered a timely speech about how the community’s policy priorities are advancing through Congress. He also spoke of the merits of AHEPA’s work with providing service dogs for veterans. In addition, AHEPA family leaders offered farewell remarks as their terms in office came to close. They included: Supreme President Carl R. Hollister, Daughters of Penelope Grand President Eva Jean Fomalont, Sons of Pericles Supreme President Bill Poulos III, and Maids of Athena Grand President Sophia Shakolas. Also, during the evening, the Pontian Society of Philadelphia entertained the audience with traditional dances with many individuals from the crowd joining in. During the course of the evening, tens of thousands of dollars in grants or donations wereannounced by AHEPA family entities to worthy causes, including by Supreme President Carl Hollister. 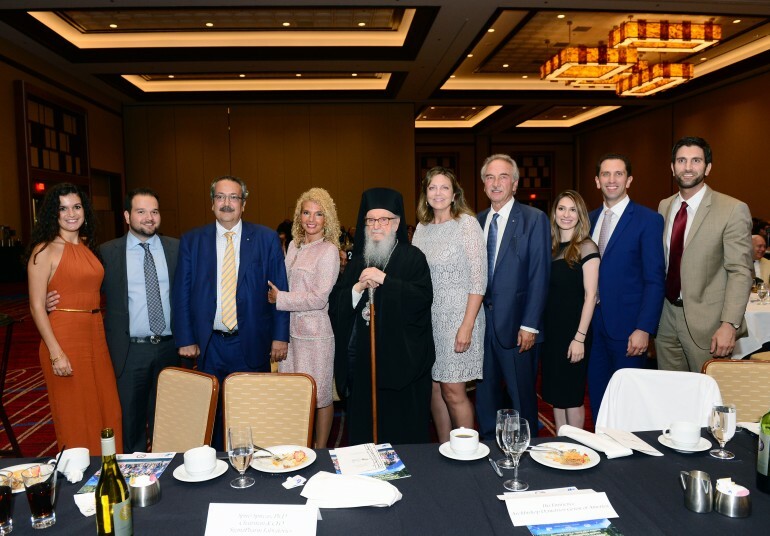 He presented Archbishop Demetrios and Saint Basil Academy Board President Evellyn Tsiadis with a $33,000 donation for a new furnace generator at the Academy. AHEPA National Housing Corporation (ANHC) President Angelo Kostarides announced a series of grants, including a $15,000 donation to sponsor its first service dog for a veteran to be named, “Nick S.” in honor of two stalwarts of AHEPA’s Housing Program, former Chairman Emeritus Nick Stratas, who passed away in March; and Past Supreme President and former AHEPA Management Company President/CEO Nick Smyrnis. Kostarides also announced grants of $10,000 each to the Sons of Pericles and Maids of Athena, $2,000 to support the Daughters of Penelope “Salute to Women” program, and $60,000 to support The Ahepan. 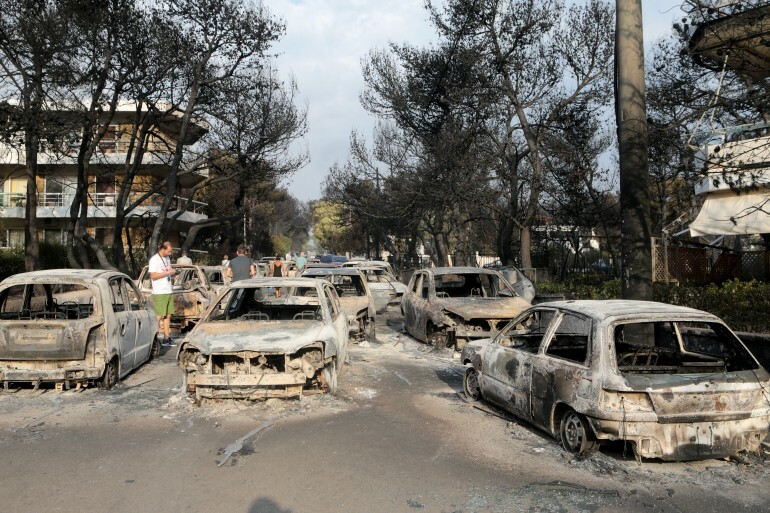 In addition, then Maids of Athena Grand President Shakolas announced a series of donations: $13,000 to Saint Basil Academy, $6,000 to the Cyprus Children’s Fund; and $1,000 for Greece wildfires relief. Συγκίνηση στην Ελληνοαμερικανική Κοινότητα προκάλεσε η τραγωδία στην Ανατολική Αττική και ήδη έχουν ξεκινήσει ερανικές προσπάθειες για την ανακούφιση των θυμάτων. Στους 74 νεκρούς και 187 τραυματίες έχουν φτάσει μέχρι τώρα τα θύματα της ολέθριας πυρκαγιάς που ξέσπασε τη Δευτέρα στην Καλλιτεχνούπολη και έφτασε μέχρι το Μάτι, όπου και συντελέσθηκε η μεγάλη τραγωδία. Σε τριήμερο εθνικό πένθος βρίσκεται η Ελλάδα ανέφερε σε δηλώσεις του ο Έλληνας Πρωθυπουργός Αλέξης Τσίπρας. Όπως επεσήμανε τίποτα και κανένας δεν θα ξεχαστεί και τίποτα όπως είπε δεν θα μείνει αναπάντητο αναφορικά με την πυρκαγιά. Με ανακοίνωσή της η Ιερά Αρχιεπισκοπή Αμερικής εκφράζει βαθιά θλίψη και αγωνία για τις καταστροφικές πυρκαγιές στην ανατολική Αττική, οι οποίες κατέστρεψαν κατοικημένες περιοχές και δασικές εκτάσεις, προξένησαν την απώλεια της ζωής δεκάδων συνανθρώπων μας, τον τραυματισμό πολλών άλλων δεκάδων και την καταστροφή των κατοικιών και των περιουσιών των, ενώ αυτή τη στιγμή υπάρχει ένας σημαντικός αριθμός αγνοουμένων. «Εκφράζω τα ειλικρινή μου συλλυπητήρια προς τον Ελληνικό λαό για την αναπάντεχη αυτή τραγωδία. Ως Έλληνες Ορθόδοξοι στην Αμερική είμαστε στο πλευρό των πληγέντων αδελφών μας στην Ελλάδα και προσευχόμεθα ενθέρμως για τις οικογένειες που επλήγησαν από τον καταστροφικό αυτό όλεθρο, με την ελπίδα ότι σύντομα θα αποκατασταθούν ευνοϊκές συνθήκες για ανάπτυξη ζωής και προόδου στις πληγείσες περιοχές», δήλωσε ο Αρχιεπίσκοπος Αμερικής Δημήτριος. Ο Αρχιεπίσκοπος απηύθυνε την Τρίτη συλλυπητήριες επιστολές προς τον Πρόεδρο της Ελληνικής Δημοκρατίας Προκόπη Παυλόπουλο, τον Πρωθυπουργό της Ελλάδος Αλέξη Τσίπρα, τον Αρχιεπίσκοπο Αθηνών και Πάσης Ελλάδος Ιερώνυμο, τον Μητροπολίτη Μεσογαίας και Λαυρεωτικής Νικόλαο και τον Μητροπολίτη Κηφησίας, Αμαρουσίου και Ωρωπού Κύριλλο. Στην ίδια εγκύκλιο ο Αρχιεπίσκοπος ζήτησε από τις ενορίες να διεξάγουν ειδικό έρανο (να περιαχθή ειδικός δίσκος) στις επόμενες δύο Κυριακές για την ανακούφιση των θυμάτων και την προσφορά βοηθείας και ελπίδος στους ανθρώπους εκείνους των οποίων τα σπίτια και οι περιουσίες έχουν καταστραφεί. Όλες οι προσφορές είτε ενοριών είτε ατομικές πρέπει να αποστέλλονται στην Ι. Αρχιεπισκοπή με την ένδειξη (memo) Attica Fires Relief Fund. Στους 74 νεκρούς και 187 τραυματίες έχουν φτάσει μέχρι τώρα τα θύματα της ολέθριας πυρκαγιάς που ξέσπασε χτες στην Καλλιτεχνούπολη και έφτασε μέχρι το Μάτι, όπου και συντελέσθηκε η μεγάλη τραγωδία, σύμφωνα με την τελευταία ενημέρωση από την εκπρόσωπο του Πυροσβεστικού Σώματος, Σταυρούλα Μαλλίρη. Ειδικότερα, όπως είπε η κ. Μαλλίρη, σύμφωνα με τα τελευταία επίσημα στοιχεία, ο αριθμός των νεκρών αυξήθηκε στους 74, ενώ οι ενήλικες τραυματίες είναι 164, από τους οποίους οι 71 παραμένουν για νοσηλεία και οι 10 είναι διασωληνωμένοι. Επίσης 23 παιδιά χρειάστηκαν ιατρική φροντίδα και 11 από αυτά νοσηλεύονται, χωρίς να εμπνέει ανησυχία η κατάσταση της υγείας τους. Το πιο σημαντικό όμως είναι, ότι το δύσκολο έργο για τον εντοπισμό αγνοουμένων δεν έχει τελειώσει, καθώς το κέντρο της Πυροσβεστικής και οι άλλες υπηρεσίες έχουν δεχτεί δεκάδες κλήσεις, και διεξάγονται πεζές περιπολίες από 130 μέλη των Ενόπλων Δυνάμεων και του Πυροσβεστικού Σώματος, στις περιοχές Βουτζά, Μάτι και Ραφήνα. Το Πυροσβεστικό Σώμα εκφράζει τη θλίψη του για την απώλεια των συνανθρώπων μας και την αμέριστη συμπαράστασή του στους πληγέντες. Παράλληλα, κάνει έκκληση στους συγγενείς και οικείους των αγνοοουμένων, προκειμένου να οριστικοποιηθεί ο αριθμός τους, να επικοινωνούν στο τηλεφωνικό αριθμό 199 για να δηλώσουν τους ανθρώπους που αναζητούν, δίνοντας τις απαραίτητες πληροφορίες και στοιχεία. Σε ό,τι αφορά στα μέτωπα των πυρκαγιών, φαίνεται πως το πιο σοβαρό πρόβλημα εντοπίζεται στην πυρκαγιά της Κινέτας, η οποία ξεκίνησε χτες από την θέση Αέρας στα Γεράνεια ‘Ορη και βρίσκεται σε εξέλιξη. Οι τελευταίες πληροφορίες από την πυροσβεστική, αναφέρουν ότι αυτή την ώρα υπάρχει ένα μέτωπο το οποίο κινείται προς τους Αγίους Θεοδώρους Κορινθίας, χωρίς όμως μέχρι στιγμής να απειλείται κατοικημένη περιοχή μέχρι στιγμής. Στην περιοχή επιχειρούν 150 πυροσβέστες με 74 οχήματα και 17 άτομα πεζοπόρων. Επιπλέον, στην επιχείρηση κατάσβεσης συμμετέχουν 4 εθελοντικά οχήματα, 20 υδροφόρες και 6 μηχανήματα έργου από την Περιφέρεια Αττικής, τους δήμους Μεγαρέων, Λουτρακίου, Βάρης- Βουλιαγμένης, ενώ οι ένοπλες δυνάμεις συνδράμουν με τρία μηχανήματα έργου. Από αέρος επιχειρούν 7 ελικόπτερα και 1 αεροπλάνο καναντέρ. Στη Καλλιτεχνούπολη του δήμου Ραφήνας – Πικερμίου Αττικής. Στην κατάσβεση λαμβάνουν μέρος 190 πυροσβέστες με 96 οχήματα, 12 εθελοντικά πυροσβεστικά οχήματα με 25 εθελοντές, 46 άτομα πεζοπόρους, ενώ από αέρος επιχειρούν 2 αεροσκάφη. Στο Ζεμενό Κιάτου Κορινθίας. Στην κατάσβεση επιχειρούν 100 πυροσβέστες με 45 οχήματα, 15 πεζοπόρους πυροσβέστες και 1ελικόπτερο. Στην πυρκαγιά στον Πλατανιά Χανιών στη θέση Κακόπετρα, επιχειρούν 15 οχήματα με 50 πυροσβέστες και ένα πεζοπόρο τμήμα. Τις προσπάθειες κατάσβεσης συνδράμουν από αέρος 2 ελικόπτερα. Στην περιοχή Λάρυμνα Φθιώτιδας επιχειρούν 10 οχήματα με 20 πυροσβέστες, 1 ομάδα πεζοπόρος και 1 ελικόπτερο. Ο απολογισμός αναμένεται να γίνει ακόμα πιο βαρύς, με αξιωματούχους των σωμάτων ασφαλείας να εκτιμούν πως ο αριθμός των αγνοούμενων είναι τριψήφιος. Το ερώτημα είναι εάν ορισμένοι από τους δηλωμένους αγνοούμενους περιλαμβάνονται στα θύματα που δεν έχουν ταυτοποιηθεί. Αξιωματούχοι της Πυροσβεστικής έκαναν νωρίτερα ιδιαίτερα δυσοίωνες εκτιμήσεις όσον αφορά την τύχη των αγνοούμενων, περισσότερες από 24 ώρες μετά την έναρξη της φωτιάς. Σύμφωνα με τα μέχρι τώρα επίσημα στοιχεία, τουλάχιστον 187 τραυματίες μεταξύ των οποίων και 23 παιδιά. Εντεκα τραυματίες από τις πυρκαγιές στην Αττική παραμένουν διασωληνωμένοι, όπως δήλωσε ο διοικητής του Εθνικού Κέντρου Επιχειρήσεων Υγείας (ΕΚΕΠΥ) Νίκος Παπαευσταθίου. Με τον Έλληνα ομόλογό του συνομίλησε ο Τούρκος υπουργός Γεωργίας και Δασών, Μπεκίρ Πακντεμιρλί λέγοντάς του ότι στη Σμύρνη είναι σε ετοιμότητα ανά πάσα στιγμή, να απογειωθούν τουρκικά αεροσκάφη της πυροσβεστικής. Όπως μεταδίδουν τουρκικά μμε ο Τούρκος Υπουργός είπε ότι αυτή τη στιγμή δεν έχει γίνει ανάλογο αίτημα από την Ελλάδα. Ο Τούρκος Πρόεδρος Ερντογάν πάντως δήλωσε έτοιμος για να βοηθήσει. “Μπορούμε να στείλουμε κάθε είδους βοήθεια στην Ελλάδα εάν χρειαστεί”, δήλωσε ο Τούρκος Πρόεδρος Ταγίπ Ερντογάν, εκφράζοντας συλλυπητήρια στον ελληνικό λαό για τις απώλειες ζωών από τις πυρκαγιές στην Ελλάδα. Τη θλίψη του εξέφρασε ο «Πρωθυπουργός» Τουφαν Ερχιουρμαν, ενώ συλληπητήρια απέστειλε και ο ηγέτηε της τ/κ Δεξιάς, Χιουσεγιν Οζγκιουργκιουν. Παράλληλα, Το Ρεπουμπλικανικό Τουρκικό Κόμμα μόλις ξεκίνησε εκστρατεία για περισυλλογή αγαθών πρώτης ανάγκης. Την οδύνη όλης της Ορθόδοξης Εκκλησίας της Αφρικής, αλλά και της Ομογένειας της Αιγύπτου, μεταφέρει, με συλλυπητήρια επιστολή του προς τον Πρωθυπουργό Αλέξη Τσίπρα, ο Πατριάρχης Αλεξανδρείας Θεόδωρος. «Ο Ελληνισμός σήμερα θρηνεί» γράφει συγκλονισμένος από την ανείπωτη τραγωδία στην Αττική ο Αλεξανδρινός Προκαθήμενος, εκφράζοντας τη συμπαράστασή του και τις προσευχές του προς τους πληγέντες. Και εύχεται ο Κύριος να χαρίσει ανάπαυση σε όλους εκείνους που έχασαν τη ζωή τους με τραγικό τρόπο. Ο Πρόεδρος της Ευρωπαϊκής Επιτροπής Ζαν Κλωντ Γιούνκερ απέστειλε επιστολή στον Έλληνα Πρωθυπουργό και συνομίλησε τηλεφωνικώς με τον Προκόπη Παυλόπουλο εκφράζοντας την αλληλεγγύη του αλλά και υπογραμμίζοντας οτι η Ε.Ε θα παρέσχει όποια βοήθεια θέλει. Εκτός από τα 64 μέλη που αποτελείται η κυπριακή αποστολή που ρίχθηκε στη μάχη με τις φλόγες, εντός των επόμενων ωρών αναμένεται να φτάσουν στην Ελλάδα, πυροσβεστικά αεροσκάφη από Ισπανία και Ιταλία. Οι αδελφοί Κύπριοι από το πρωί επιχειρούν μαζί μας, εδώ και λίγες ώρες άρχισε η ροή πληροφοριών από εναέρια μέσα ΗΠΑ, σε λίγο υποδεχόμαστε στην Ελευσίνα πυροσβεστικά αεροσκάφη από Ιταλία και Ισπανία. Υπεράνθρωπες οι προσπάθειες Ελλήνων αξιωματικών, υπαξιωματικών, οπλιτών,πολιτών. Σε ό,τι αφορά τις υλικές καταστροφές, οι ολικές καταστροφές σπιτιών φτάνουν τις 2.500 σπίτια ενώ άλλες 4.000 έχουν υποστεί σημαντικές ζημιές. Η περιφέρεια ανατολικής και δυτικής Αττικής κηρύχθηκαν σε κατάσταση έκτακτης ανάγκης μετά την ανείπωτη τραγωδία που έχει αφήσει πίσω της περιουσίες κατεστραμμένες και πολίτες σε κατάσταση απόγνωσης. Η κατάσταση στα μέτωπα των πυρκαγιών στις περιοχές της Αττικής όπου επιχειρεί η κυπριακή αποστολή είναι ομαλή, δήλωσε στο ΚΥΠΕ ο Βοηθός Διευθυντής Επιχειρήσεων της Πυροσβεστική Υπηρεσίας Λεωνίδας Λεωνίδου, ο οποίος βρίσκεται με την κυπριακή αποστολή που μετέβηκε σήμερα στην Αττική προκειμένου να βοηθήσει στην αντιμετώπιση των πυρκαγιών. Ερωτηθείς για το πού επιχειρούν τα μέλη της κυπριακής αποστολής, ο κ. Λεωνίδου είπε ότι στο μέτωπο της πυρκαγιάς στο Μάτι επιχειρούν τα μέλη της Πυροσβεστικής Υπηρεσίας και της Πολιτικής Άμυνας. Στην περιοχή, συνέχισε, είναι και τα τέσσερα μέλη της Υπηρεσίας Ασθενοφόρων. Ανέφερε, επίσης, ότι τα 20 μέλη του Τμήματος Δασών επιχειρούν στο μέτωπο της πυρκαγιάς της Κινέτας. Κληθείς να σχολιάσει την κατάσταση στα μέτωπα των πυρκαγιών, ο κ. Λεωνίδου είπε ότι η κατάσταση τώρα είναι ομαλή. «Κατασβένονται μικροεστίες οι οποίες απειλούν αναζωπυρώσεις. Δεν υπάρχει στο μέρος που είμαστε εμείς οποιαδήποτε μεγάλη πυρκαγιά αυτή την στιγμή. Επιχειρούν τα πτητικά μέσα ακατάπαυστα από την ώρα που ήρθαμε. Είμαστε εδώ γύρω τις 16:00 και ξεκινήσαμε να επιχειρούμε. Η κατάσταση είναι αρκετά καλή, πάρα πολύ καλή . Δεν πνέουν δυνατοί άνεμοι. Είμαστε πολύ ευχαριστημένοι», συμπλήρωσε. Ο Ρώσος πρόεδρος Βλαντίμιρ Πούτιν με τηλεγράφημά του, προς τον πρόεδρο της Δημοκρατίας Προκόπη Παυλόπουλο και τον Έλληνα πρωθυπουργό Αλέξη Τσίπρα, εκφράζει τα συλλυπητήριά του προς την ελληνική κυβέρνηση και προσφέρθηκε να συνδράμει την Ελλάδα με την αναγκαία βοήθεια ώστε να αντιμετωπίσει τις συνέπειες των φονικών πυρκαγιών, αναφέρει ανακοίνωση του Κρεμλίνου. και εκφράζει την συμπόνια και την συμπαράστασή του στους συγγενείς και οικείους των θυμάτων, καθώς και τις ευχές του για ταχεία ανάρρωση όλων των τραυματιών» αναφέρει η ανακοίνωση του Κρεμλίνου. Τηλεφωνική επικοινωνία είχε ο Έλληνας Πρωθυπουργός Αλέξης Τσίπρας με τον Τούρκο Πρόεδρο Ερντογάν. Ο ίδιος δήλωσε πως είναι έτοιμος να βοηθήσει εαν χρειαστεί. Ο κ. Ερντογάν εξέφρασε τα συλληπητήριά του προς τον ελληνικό λαό. «Καταθέτω την ειλικρινή μου αλληλεγγύη και τα συλλυπητήρια στον Έλληνα συνάδελφο Νίκο Κοτζιά μετά τις καταστροφικές δασικές πυρκαγιές κοντά στην Αθήνα», γράφει στον προσωπικό του λογαριασμό στο Twitter ο υπουργός Εξωτερικών της Ολλανδίας Στεφ Μπλοκ. «Οι σκέψεις μου είναι με τα θύματα και τους οικείους τους» σημειώνει στην ίδια ανάρτηση ο κ. Μπλοκ. Επίσης, σύμφωνα με διπλωματικές πηγές, με τον κ. Κοτζιά επικοινώνησε και ο βοηθός υπουργός Εξωτερικών των ΗΠΑ Γουές Μίτσελ για να εκφράσει τα συλλυπητήρια, την αμέριστη συμπαράσταση και την αλληλεγγύη των ΗΠΑ προς τον ελληνικό λαό. Με τον Έλληνα υπουργό Εξωτερικών επικοινώνησε ακόμα και ο αντιπρόεδρος της πΓΔΜ Μπουγιάρ Οσμάνι, για να του εκφράσει τα θερμά συλλυπητήρια του. Μιλώντας στο ΑΠΕ-ΜΠΕ για όλη αυτή την προσπάθεια που συνεχίζεται 24 ώρες μετά, ανέφερε: «Από χτες το βράδυ οργανώσαμε μια ολόκληρη επιχείρηση, μαζί με την κεντρική διοίκηση και μέλη της κυβέρνησης, ώστε να υπάρχουν κλίνες για τους ανθρώπους που είχαν χάσει τα σπίτια τους. Επειδή όμως αυτές οι κλίνες, λόγω και της θερινής περιόδου, δεν ήταν στα διοικητικά όρια του δήμου, πολλοί κάτοικοι αρνήθηκαν να φύγουν, γιατί ήθελαν να παραμείνουν εδώ και να δουν αν το σπίτι τους έχει καεί, φοβόντουσαν και για κλοπές. Το αποτέλεσμα ήταν να φύγουν κάποιοι που είχαν οικογένειες, όμως κάποιοι άλλοι θέλησαν να μείνουν, οπότε φιλοξενήθηκαν στο κλειστό γυμναστήριο. Σήμερα διαθέτουμε κλίνες μέσα στον δήμο Ραφήνας, στις κατασκηνώσεις με σπίτια αυτόνομες κατοικίες, που έχουν παραχωρηθεί δωρεάν από τη δήμαρχο Ζωγράφου. Έχουμε λύσει ήδη το θέμα της σίτισης, τα τρόφιμα που έχουμε είναι υπεραρκετά και έχουμε μερίδες φαγητού». The EU summit meeting on migration was very difficult, and it appears that not all member-states share the same values and principles, Prime Minister Alexis Tsipras said in Brussels on Friday. At a press conference he gave following the meeting, Tsipras said that it appeard that “what we knew as founding principles and values of the EU – solidarity, humanism, respect for human rights and international law – is not common ground for all 28 members,” he said. A danger of postponing indefinitely the prospect of reviewing the Dublin treaty on migration towards a more just direction was averted, he said; the attempt was to postpone the review until it was entirely cancelled following the Euroelections of 2019. The prime ministers of Greece, Alexis Tsipras, Spain, Pedro Sanchez, and German chancellor Angela Merkel, met in Brussels on Friday on the sidelines of an EU summit and reached an agreement on handling the migrant and refugee’s crisis. “Germany, Greece and Spain underline their support for concluding the revision of the Common European Asylum System in 2018, with the aim of striking the right balance between a fair sharing of responsibility and solidarity. Until entry into force of the new Common European Asylum System, interim measures established by those member states willing to move ahead collectively on a European level, are the best way to proceed. On this basis, in response to possible crises, we support adopting additional immediate operational EU initiatives, based on solidarity, including through burden sharing. We underline that member states at the external border need more joint support, financially and regarding police and asylum officers. Positive actions will be taken swiftly, in support of the five Aegean islands in Greece and in support of Spain. Greece and Spain are ready to readmit asylum seekers identified in the future at the German-Austria border by German authorities, who have a Eurodac entry from the aforementioned countries. Germany will gradually accept and conclude the family reunification cases in Greece and Spain with a view to guaranteeing family unity. The operational details of the aforementioned actions will be agreed upon within the next four weeks and reviewed regularly. Cooperation will start immediately once this agreement is reached. According to the German press agency DPA, German Chancellor Angela Merkel has secured agreements with 14 European Union countries to rapidly return some asylum seekers as she seeks to end a schism in her government over migration policy. Merkel is also aiming to establish “anchor centers” to process migrants at Germany’s borders. Both the CDU and the CSU are holding separate meetings Sunday to discuss Merkel’s latest efforts on migration and plot their next steps. In the eight-page letter obtained Saturday by dpa, the chancellor said that she had also secured agreement with half of the EU nations to return migrants to them if they’d first registered in those countries. The countries included Hungary, Poland and the Czech Republic, which have all been harsh critics of Merkel’s welcoming stance to migrants, as well as Belgium, France, Denmark, Estonia, Finland, Lithuania, Latvia, Luxembourg, the Netherlands, Portugal and Sweden. I will disagree with the title “Omogeneia and Phanar turned upside-down, following Valiotis statement” in the website hellasjournal.com of my good colleague Michalis Ignatiou. Even if some were provoked by Valiotis’ criticism for Phanar and his references to autocephaly, what really turned things “upside-down” were the reactions to the Valiotis speech and the attempt through these reactions to deal a “final blow” to Archbishop Demetrios, and if possible during the upcoming meeting of the Holy Synod of the Ecumenical Patriarchate, next week in Phanar. With most of the controversial statements of Stathis Valiotis, I disagree. An autocephalous archdiocese of America will be the final blow to the defenses against assimilation of the Greek Orthodox Church and Hellenism in America. Moving of the Ecumenical Patriarchate voluntarily away from Constantinople will signal the beginning of messy and turbulent times in Orthodoxy around the world and could culminate to the loss of the leadership role the Patriarchate enjoys among the Orthodox, which will be captured by mighty Moscow. The question as to what position will Phanar take should there be a Greek-Turkish conflict is rather demeaning for the Ecumenical Patriarchate, as many heads of patriarchs and hierarchs of the Ecumenical throne have rolled by the turkish sword. All these references would have minimal appeal among the Greek-Orthodox in America, who do not share such views. But, following the verbally violent reactions, beginning with the one from the Archons, the issue was blown up with the obvious target being Archbishop Demetrios (mainly) and secondarily Metropolitan Methodios of Boston. Mr. Valiotis was speaking in the commencement ceremony of an institution of higher education, which, as such, owes primarily to respect freedom of speech. Reactions, interruptions and disapproving boos coming from the public in attendance or the students or the graduates, could also be considered expressions of free speech, but if they were coming from Archbishop Demetrios, the other four metropolitans present or the School administration would be firstly considered rudeness and secondly a gag on free speech. Doing such a thing would not reflect well on a respected hierarch and academic as Archbishop Demetrios. As for Mr. Valiotis – who has a theology degree from Greece – the honor that was bestowed upon him from Hellenic College was a doctorate of humane letters and not Orthodox Theology. Normally, someone who has donated not just ten, but more than twenty million dollars to the Archdiocese and to schools and parishes of the Archdiocese in America, some millions to the Technical College of Sparta and many other institutions in Greece and America, would be deserving of such an honor and title regardless of some of his views. And those who feel that this honor demeans the College and our Church, let them return the money he has donated to the Archdiocese and our parishes, after they first replenish them with their own. It is a parphrasis of a report of Metropolitan Antonios of San Francisco, of blessed memory, to Ecumenical Patriarch Bartholomew, in May of 1998, which we heard with our own ears and was concerning the “man of the Ecumenical Patriarch in America” Fr. Alexander Karloutsos. We wrote it then in the daily “Proini” and we have repeated it courageously in recent years, especially after the multiple instigated “admonitions” to Archbishop Demetrios to resign, because in one way or another he will be forced to – just to recall an editorial by the publisher of the National Herald. The “indignant” Archons have announced they decided to honor this year in October with the Athenagoras Award Fr. Alexander Karloutsos and they write about him – among other things – that he has served as assistant to three Archbishops. What they have omitted to mention is that this assistant has gotten rid of two Archbishops (Iakovos and Spyridon) and he is preparing to get rid off Demetrios as well. He is the perfect Brutus, even though none of the two said: “Even you Fr. Alexandre? (et tu Brute?) If there is a Brutus Award, he deserves it! Second, to have one and only one Archbishop. During the last few years, as some, for self-serving purposes only, are trying to incite an ecclesiastical crisis, we, that have lived through it twice during Iakovos and Spyridon, have stated with courage that we do not intent to get entangled in the division of the Greek American Community, a division which some want to profit from. Valiotis did not speak neither about the nature of God nor about the question of whether Panagia is Mother of God, Theotokos or Christotokos; and his critics are neither Athanasioses nor Cyrills. Therefore, what is the conclusion? 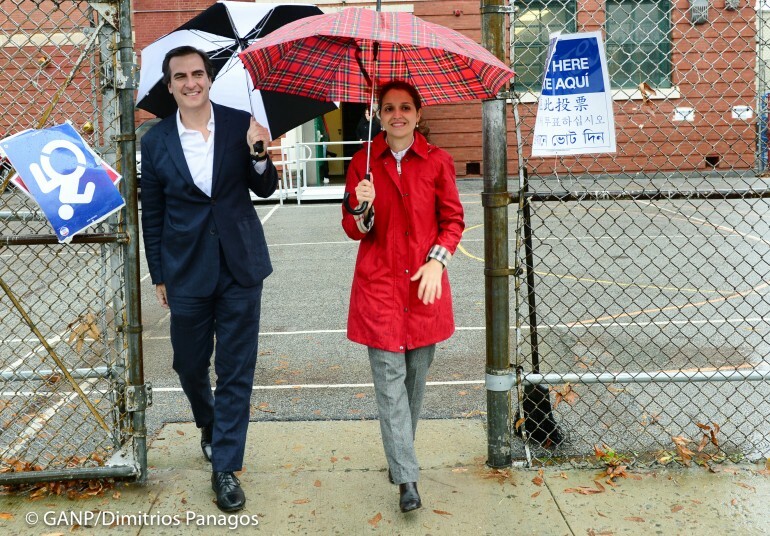 The Archdiocese in America, after Iakovos, has lost a great deal of its autonomy; and all the possibilities for decisions on its own without a veto from the Phanar, have dramatically been restricted by consecutive charter changes. Worst of all, the two large independent funds that have been created and the changes silently being advanced in the Archons organization (some say that each one will contribute $10K and the sums will be sent to the Patriarchate) will financially bleed-dry the Archdiocese and the parishes in particular. Especially for the latter, when there are financial difficulties, the “Greek School” is the first victim. For us, these are the basic issues and not if Archbishop of America becomes the Metropolitan of France, or Elpidoforos, or Methodios, or Evangelos, or someone else. Greece decides on F-16 warplane upgrade just on time for Apostolakis’ visit to U.S.
Greece on Saturday announced an upgrade for part of its US-made F-16 warplane fleet, a programme pending over the past six months owing to cost concerns. An emergency meeting by the government council of foreign affairs and defense chaired by Prime Minister Alexis Tsipras approved the decision, the PM’s office said. “The council unanimously approved the implementation of the 85-plane upgrade programme,” Tsipras’ office said. Defense Minister Panos Kammenos said the planes would be upgraded to F-16 Viper level. The F-16V variant includes an active electronically scanned array radar, a new mission computer and electronic warfare suite, automated ground collision avoidance system, and various cockpit improvements. The F-16V first flew in October 2015. The decision was made on time for the scheduled official visit to the United States of the Chairman of the Joint Chiefs of Staff of Greece, Admiral Apostolakis, on the invitation of his U.S. counterpart General ‎Joseph Dunford. 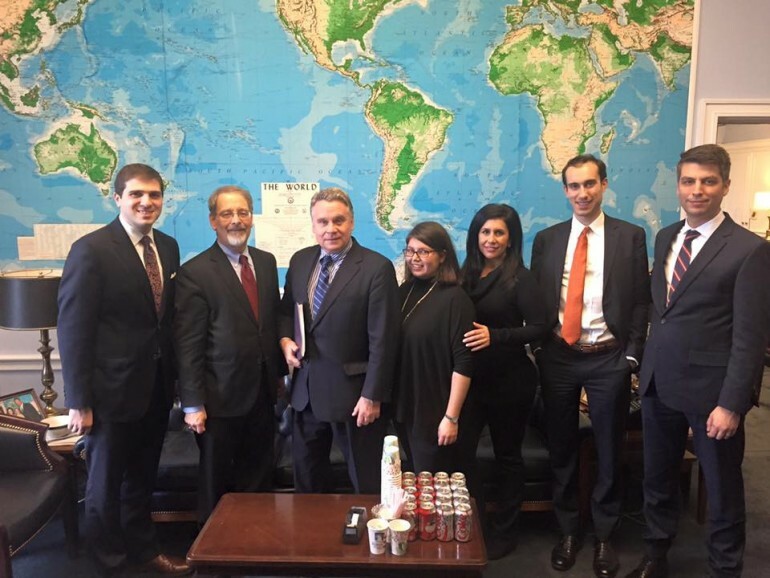 Admiral Apostolakis will be in Washington on May 1st and besides high level talks at the Pentagon he will hold meetings with prominent member of the U.S. Congress. US Ambassador Geoffrey Pyatt welcomed Government Council of Defence and Foreign Affairs (KYSEA) unanimous approval for the upgrading of the Greek fleet of F-16 fighters jets in a tweet on Saturday. A very big day for our @HAFspokesman and @Hellenic_MOD allies as the Greece F-16 upgrade moves ahead – building on Prime Minister @tsipras_eu visit to the White House last October. Congratulations Minister @PanosKammenos and team, Pyatt posted on his twitter account. New Democracy’s shadow defense minister Vasilis Kikilias said the main opposition was always in favor of an F-16 upgrade and will wait for the details of the deal with the United States before commenting further. According to the Greek Defense Ministry, the deal will cost Athens about 1.1 billion euros ($1.3 billion), including 10-15 percent discount granted by the United States. Three of the 85 jets earmarked for modernisation will be upgraded in the United States while the rest will be refurbished in Greece, a Greek defence ministry source said, adding that the cost would be about 1.2 billion euros. The first modernized jet will be delivered to Greece in two years, while the whole bunch will be upgraded by 2028. The upgrade will include up to 125 APG-83 Active Electronically Scanned Array (AESA) Radars, 123 Modular Mission Computers (MMCs), 123 LINK-16 Multifunctional Information Distribution System Joint Tactical Radio Systems (MIDS-JTRS). Ta Nea daily on Saturday said the programme runs to 2028, with annual payments until 2021 set at a maximum of 120 million euros owing to Greece’s bailout obligations. Tsipras has said the planes, some of them dating from 1989, risked being rendered inoperable without the upgrade. The upgrade deal was first announced in October during a Tsipras visit to Washington, but the government came under immediate criticism over the price tag. The U.S. State Department at the time estimated the cost to upgrade around 120 Greek F-16s at more than $2.4 billion for a 10-year programme. Greece spends two percent of its budget on defense, one of only five NATO members to meet this alliance target. Greek fighter planes see extensive action in the Aegean Sea. They are regularly scrambled to intercept Turkish jets entering what Athens considers Greek airspace over the Aegean, occasionally engaging in mock dogfights. The move comes amid increased tension with NATO ally Turkey. In a barrage of recent statements, Ankara officials have disputed Greek sovereignty of a number of islets close to Turkey’s Aegean shores. Athens officials have attributed such talk to Turkey’s upcoming presidential and parliamentary elections in June. 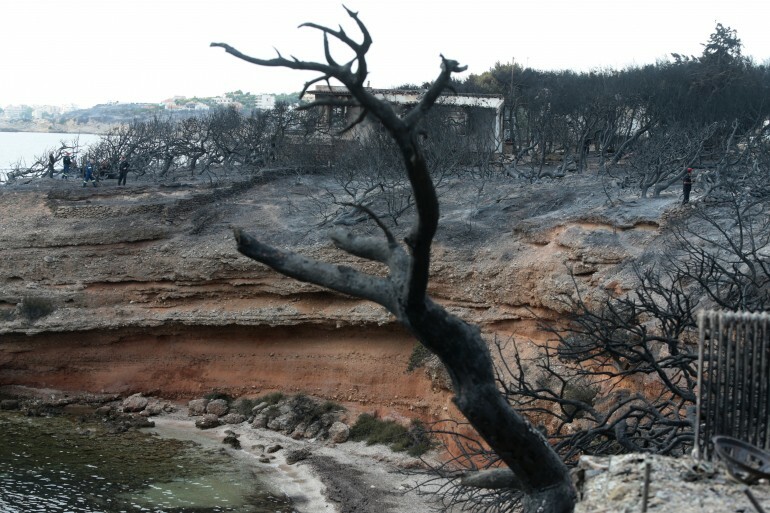 On April 9, Greek soldiers fired warning shots at a Turkish helicopter after it approached the small island of Ro, which marks their border in the Aegean Sea. Days later, the pilot of a Greek air force jet was killed when his Mirage 2000-5 jet crashed in the Aegean as it returned from an earlier interception of a Turkish jet that had violated Greek air space. Last week, deputy defense minister Fotis Kouvelis confirmed that Greece is to lease two French FREMM frigates for its navy. The lease is for five years, and the vessels are expected to be inducted into the Greek Navy by August. Read More on: Greece decides on F-16 warplane upgrade just on time for Apostolakis’ visit to U.S. In spite of the plea of EU Commission President Jean Claude Juncker to Turkey’s President Tayyip Erdogan to released the 2 Greek military officers before Greek Easter, they remain imprisoned in a jail on the outskirts of Edirne. On Holy Friday they received a visit from their family members. It was their fifth meeting behind bars after the two soldiers were arrested for accidentally crossing the border in bad weather on March 1. Earlier Friday, their parents met with officials and lawyers at the Greek consulate to be briefed on latest developments regarding the case. Meanwhile, in an interview with the weekly Documento newspaper, Greek Prime Minister Alexis Tsipras called for the immediate release of the soldiers. “Angelos and Dimitris, all Greeks demand an end to your ordeal,” Tsipras was quoted as saying, using the word “Golgotha,” or Calvary, where Jesus is believed to have been crucified and the tomb where he was buried and resurrected. In a telephone conversation with the parents of the two soldiers, alternate Defense Minister Fotis Kouvelis vowed that the government will make every effort to accelerate their release. In a tweet on Friday, New Democracy’s shadow defense minister Vassilis Kikilias wished courage and strength to the soldiers as well as their families. According to “Kathimerini”, with concerns growing in the government that the tough language used by Defense Minister Panos Kammenos about Turkey could hamper negotiations for the release of two Greek soldiers held in the neighboring country, Prime Minister Alexis Tsipras is reportedly planning a meeting with the leader of the junior coalition partner after Easter to ask him to tone down the rhetoric. The government also sought Thursday to clarify that Kammenos’s remarks referring to the imminent transfer of 7,000 troops to the Evros border region and the Aegean islands is not related to the recent spike in tension, but more to do with new organization of Greece’s armed forces, saying that, in any case, this will not take place in the immediate future. According to a senior government official, the incendiary rhetoric “is not needed” at a time when the government is trying to de-escalate tension between the countries. The government’s concern over the stance of Kammenos, who is also the leader of the nationalist Independent Greeks party, was also shared by senior officials of ruling SYRIZA, as well as opposition parties, who say that he is causing unnecessary tension and is only playing into Ankara’s hands. Speaking to Skai TV, SYRIZA lawmaker Dimitris Sevastakis warned that Greece should not allow itself to get caught in the “trap” of heightened tensions set by Erdogan. For his part, SYRIZA MEP Stelios Kouloglou told the Parapolitika radio station that “Kammenos is serving the interests of his audience” and insisted that Athens must remain decisive and calm as hints of an imminent military conflict with Turkey will impact tourism. According to Turkey’s Hurriyet daily, Celik added that the EU should reprimand Greece over some of the comments emanating from its political leadership. Greek and Turkish fighter jets engaged in two dogfights over the Aegean yesterday after the Turkish jets violated Greek airspace 16 times. The government and the main conservative opposition New Democracy party clashed Thursday over the progress of United Nations-mediated talks aimed at breaking a deadlock between Greece and the Former Yugoslav Republic of Macedonia over the latter’s name. Critical statements by ND about the government’s handling the issue “do not reflect the true state of affairs” and are “clearly aimed at serving party interests,” the ministry said. Kotzias briefed party leaders on his talks last week in Vienna with his FYROM counterpart Nikola Dimitrov. He saw Koumoutsakos instead of ND leader Kyriakos Mitsotakis, who boycotted the meeting, objecting to a split within the ruling coalition over how to handle the name talks. Kotzias is to meet again with Dimitrov for further negotiations next week. Despite progress in the talks, differences remain. Athens wants the name solution to be “erga omnes,” namely for general use at home and abroad. It also wants changes to parts of FYROM’s constitution deemed irredentist.